The refined and feminine Carrera Lady watches have been emboldened with an elegant design, while staying true to the Carrera line’s daring personality and iconic heritage. 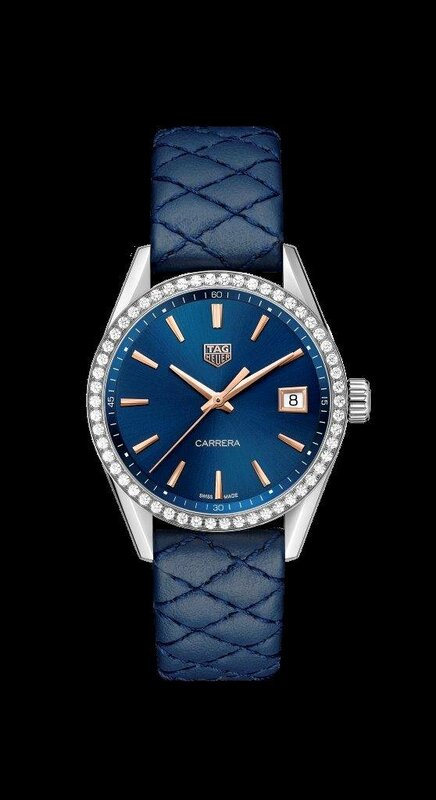 La Chaux-de-Fonds, Switzerland – 15 April 2019: Elegant and enduring, the Carrera Lady timepiece features a new design that enhances the entire 36 mm collection. 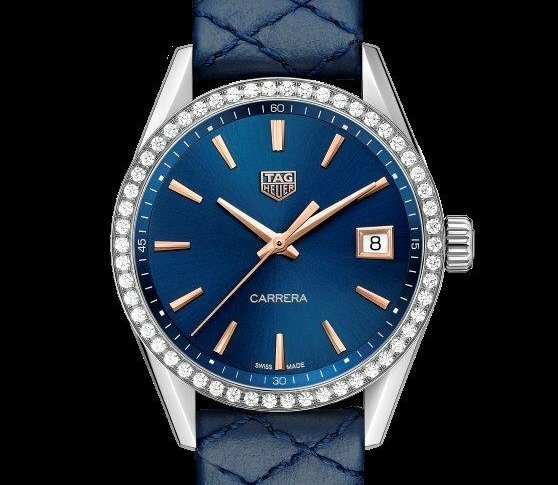 From bold colours to the improved readability of the dial, the revamped Carrera Lady timepieces, available with a quartz or automatic movement, deftly combine performance and style. With their feminine flair and understated sophistication, any one of the new models in the Carrera Lady 36 mm collection will make the ideal accessory for the discerning and confident modern urban woman. A glance at the dial reveals refined indexes and hands. 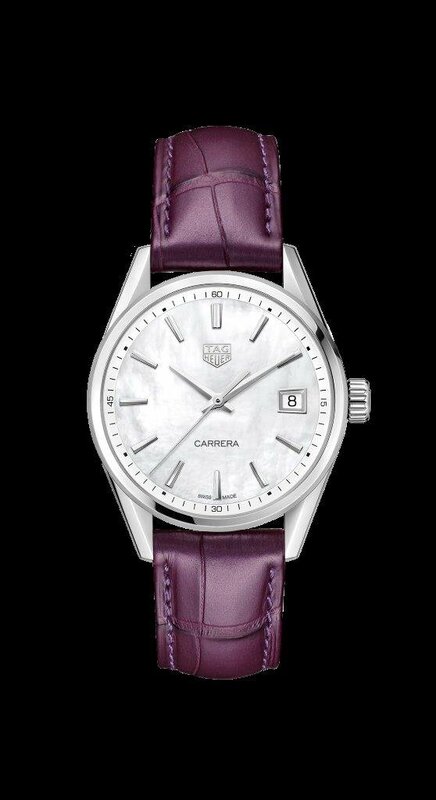 The dial is available in white mother-of-pearl, purple, blue, grey and black, and is perfectly legible thanks to its markedly pure design. A seconds scale is printed on the flange around the dial, and is surrounded by either a smooth or diamond-set bezel. A final detail that sets the new Carrera Lady wristwatches apart from their predecessors is the date window at 3 o’clock – the frame boasts an intriguing trapezoidal shape, as opposed to the square shape of the original. The 36 mm stainless-steel timepieces now feature curved lugs that are fastened to a brushed and polished stainless-steel bracelet, a calfskin strap or an alligator leather strap with a satin finish. 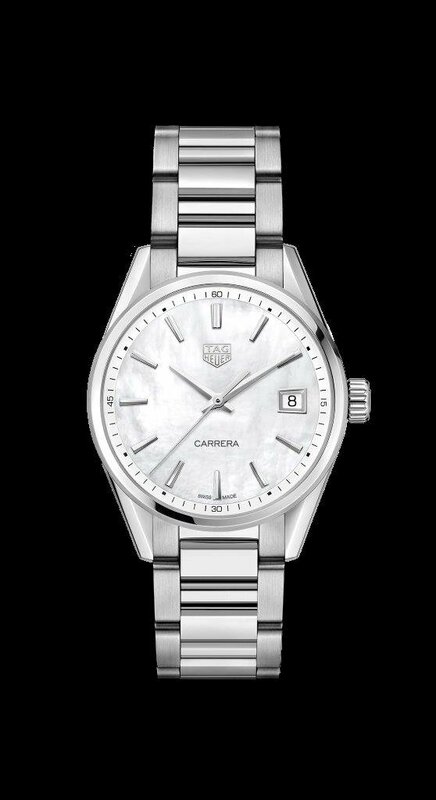 The case size, coupled with the automatic movement, makes the Carrera Lady a contemporary watch that stands out from the avant-garde Swiss watchmaker’s other ladies’ timepieces. 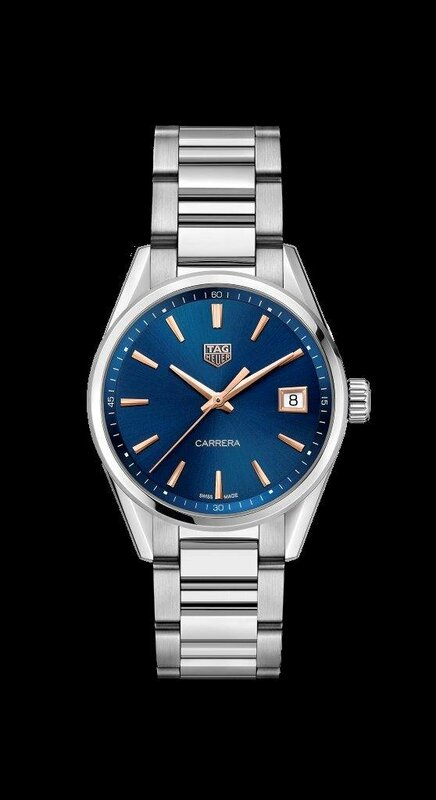 The 36 mm case is larger than those of the women’s watches that TAG Heuer generally creates, but is ideal for a statement-making piece that is robust yet classy. 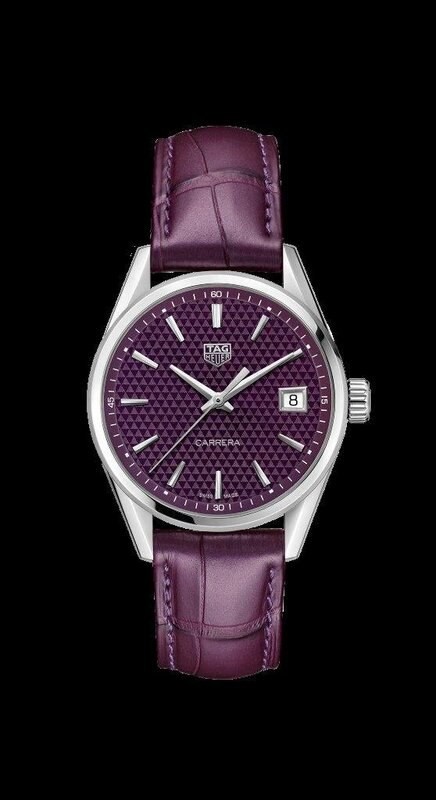 These watches for elegant women are available with purple, taupe or grey alligator leather straps, while quilted calfskin straps in black or blue also give a feminine touch to the overall look. The models powered by an automatic movement are available with a taupe-coloured alligator leather strap or a stainless-steel bracelet. 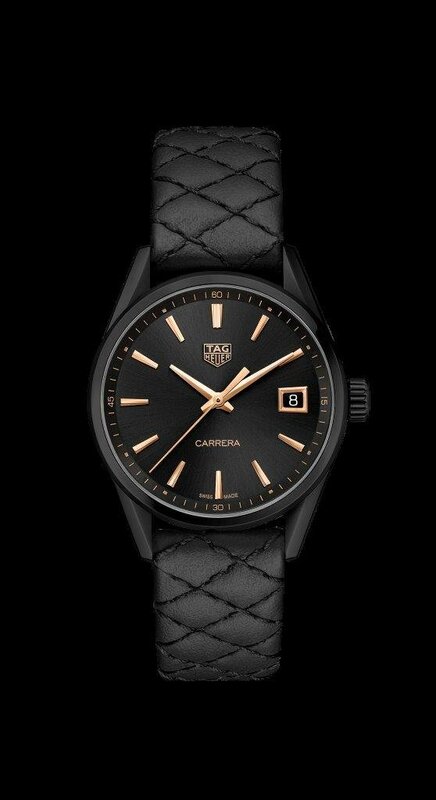 TAG Heuer chose this collection to present its new folding clasp for leather straps, which is thinner than previous models and gives the overall aesthetic of the watch a wonderfully refined appearance. The case back of the quartz-powered models is stamped with the TAG Heuer logo and collection name, along with a cross-hatched pattern that serves as a nod to the Carrera line’s motor-racing heritage. Alternatively, the mechanical-movement counterparts feature a sapphire case back that provides an unobstructed view of the automatic calibre within. 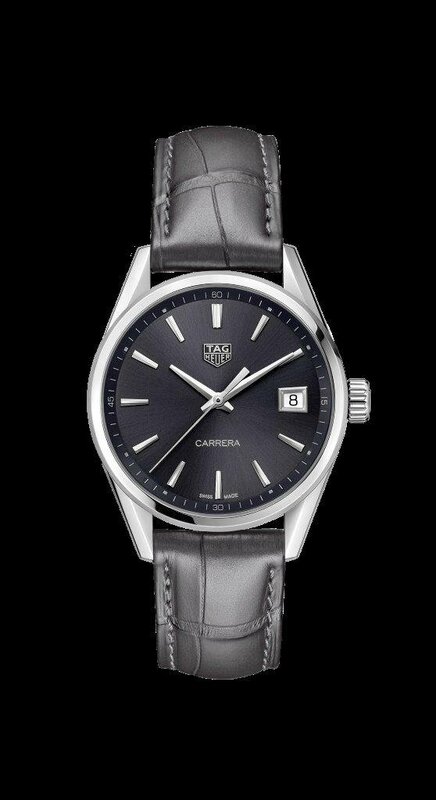 The TAG Heuer Carrera collection was originally introduced in 1963. Its bonds with the world of motor racing continue to drive the line, which has become one of the brand’s most popular and well-known collections. The Carrera Lady line is no different – focus, drive and a daring attitude distinguish both the adventurers who race for a living and the woman who knows what she wants to achieve and won’t take her foot off the gas until she gets it. With this Carrera collection, women can wear a timepiece that has been created just for them without compromising on state-of-the-art innovation, stunning design and a rich heritage.